Triad Magnetics is a global leader in the design and manufacture of transformers, power supplies, and inductors. We have more than 60 years’ of experience in innovating the design and manufacture of magnetics — among other milestones, our magnetics were used in the very first microwave ovens in the 1970s and have literally been to the moon and back. At Triad, we create high performance magnetic components that continuously set new standards in a vast variety of applications across industrial and commercial sectors. At Triad, we manufacture hundreds of different power transformers, available in more than a dozen different series, which can be used in a range of heavy duty industrial and general commercial applications. In every transformer we design, we carefully consider all variables — including power range, primary and secondary coils, and more — to ensure that they meet the uniquely precise requirements of the application for which they were designed. Our transformer offerings include a number of different models of standard power transformers, as well as control transformers, high and low frequency sense transformers, preassembled wall plug-in power supply transformers, and more. We also offer more than 60 industrial grade power supplies and over 250 different types of inductors and chokes. From the equipment used to the products manufactured, Triad’s magnetic components can be found throughout every aspect of industrial and commercial processes. Every piece of equipment requires at least one transformer, whether it is standard, toroidal, current sense, or wall plug-in. Notably, Triad Magnetics’ products are most commonly used in industrial computers, automation controls, other process controls, meters, and gauges. Magnetics are also found in secondary systems, such as the electronic ballast of facility lighting systems. Our products are not only used in the manufacturing of industrial and commercial goods, but also in the goods themselves. From handheld gaming systems and computers to appliances and even automatic window treatments, any consumer good that uses electricity requires magnetics. At our state-of-the-art manufacturing facilities, Triad Magnetics employs advanced cellular production techniques that allow us to minimize job lead time without sacrificing quality. Our magnetics meet, and often exceed, requirements and standards set by the CSA, IEC, TUV, UL, and ISA. We also use in-production inspections, pre-shipment audits, and failure analysis to ensure that our magnetics components are of the highest quality possible before delivering products to our clients. 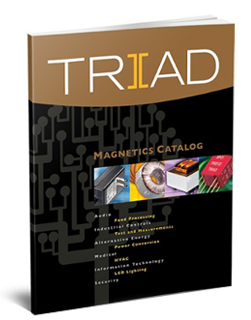 To learn more about our magnetics components and how to incorporate them into your next project, contact Triad today.